Tuesday is relatively quiet for us Canadian's in terms of loyatly rewards! The Le Club accorhotels program has added a new airline partner, Finnair Plus. You will now be able to earn Plus Points on stays at over 2,700 Accor Hotels Worldwide. Find out more here. WestJet has launched a new two day seat sale for many flights across their network Book by October 8th for travel until Feb 11, 2015 (with your usual Christmas/New Year's blackout period) Find out more about the sale here. 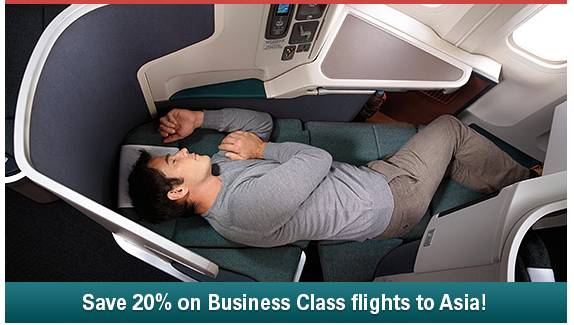 Cathay Pacific has a new business class sale on flights from Western Canada. Business Class fares from Vancouver, Calgary or Edmonton to Asia are as low as $4,506 all inclusive. Book by Oct 15 for travel until Jan 31, 15. Full details here.